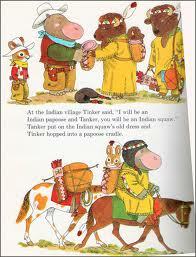 I never read this book (Tinker & Tanker) - oh, what I was missing! Thanks for sharing it. Time capsule ... that's funny ... dates back to when I was born, actually. I've not seen this one but will have to check our library; looks like it'd make for a fun friendship lesson with my peacemakers! I'm tickled at the the arrow stuck at the very top of the one bad guy's hat lol!! And it seems this story is very fitting for the time it was written, when many of the "rules" we have may have been a little different, but the foundation of the stories remain timeless. This Richard Scarry book is new to me, too. It made me think about political correctness, real differences and blandness in writing. Oh, yes, Richard Scarry was a favorite from childhood as well! In fact a I just found one of his counting books for sale at the library and snatched it up. "What Do People Do All Day" is still the one we like best. The illustrations are so crowded and busy, but encyclopedic in detail. Waaaaaaahhhhhh!!! I can't get your pick through my library! So I thank you all the more for including all the lovely spreads! Fun! I grew up with a nursery rhyme book by Richard Scarry. It may not be PC, but, my, it looks full of adventure and fun. can't go wrong with Scarry, IMO! Yes, I tried to find your pick through the library and couldn't get it. This is one book my grandsons would have adored. Glad you included more info and photos so we could see the detail. In fact, my hubby would enjoy this! You would TOTALLY love this, Erik (even though it's a little young for you at this point :)) It's very much like the old cartoons with Tom and Jerry and Road Runner and Wile E Coyote :) I hope your library has it! I hadn't seen that! Thanks so much for sharing! Yes, it was a different world! We also have many Richard Scarry books in our home. Hubby and I would joke about the stereotypes and such but we love them. Wonderful post. Richard Scarry is beloved in our home too!... in spite of the stereotypes :) So glad you enjoyed the post! You're welcome, Sue! I hope you get to red it - it's fun! I know it, Clar - all the Richard Scarry books were big favorites in our house - both when I was growing up and when my kids were little. His work is timeless. I hope your library has this so you can see it - it's very entertaining! Yes, this is VERY non-PC. You could never publish it today. And yet, the story is about the importance of friendship and helping others. The adventures are exciting and fun, which encourages children to enjoy the experience of reading. Oh gosh, I have so many fond memories of Richard Scarry - his books and also the tv specials. I read them to my kids too when they were tots. Thanks for a trip down memory lane, Susanna! What a cute fun book for kids. Love the illustrations. Sounds such hard-case. Must see if I can get it down here. Thanks Susanna. Love Richard Scarry. Never seen this one! I'm popping in to say hi and that your book review has me hoping I can find a copy at my library. I do love Richard Scarry. I tried to get this book several weeks ago after you mentioned it on my blog, but sadly, our library does not have a copy! I'm always so sad when I can't get an old book because I know it's unlikely they'll ever replace it. 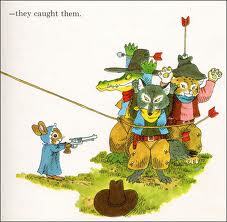 I think Richard Scarry was a big part of a lot of our childhoods! I hadn't seen this Richard Scarry book. Thanks for the great reciew!